Do not visit the Tanah Lot temple with your loved one! We recommend you definitely pay a visit to Tanah Lot temple but make sure you do not bring your loved one along! Myth has it that there is a curse for unmarried couples that visit the temple. Their relationship is doomed to end in disaster! No words can describe this feeling! 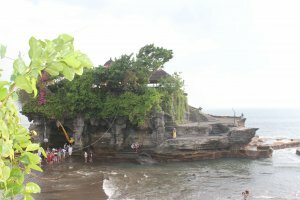 Tanah Lot temple is one of the seven sea temples of Bali. 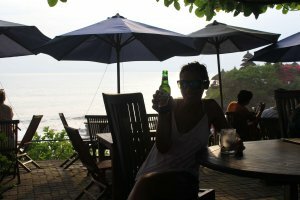 It is only a 30 minute drive from Canggu. The temple is dedicated to the sea god, Dewa Baruna or Bhatara Segara. Locals believe that venomous sea snakes guard the temple from evil spirits and intruders. Be brave enough and take the time to visit the temple. Best time to come – though it tends to get more crowded – is at sunset. The temple itself is quite impressive. It is built on a rock surrounded by water. At low tide, you can walk on foot to the rock though you are not allowed to enter the temple. Good news is that to admire the temple, you can sit in one of the sea side cafes at the terrace, order a cold Bintang( = local Balinese beer) or coconut and enjoy the sunset. Though there are plenty of restaurants that serve lunch and dinner, we do not recommend it. The place is quite touristic and pricing tends to be high. Locals living here come at least once a year on the day of the big sacrifice to appease the furious gods of the sea. Many families bring their newborn or adolescent children to introduce them to the gods of the sea and to ask of their favour. 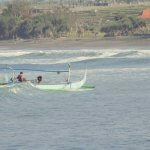 You should know that Tanah Lot serves also as a surfing spot. However, you might have problems with guards as surfing at the temple is a sacrilege. Surfing or not, you should definitely come see for yourself what Tanah Lot temple is all about!